Yes, I have finished Harry Potter and the Half-Blood Prince! And although this book is under my belt now, I still have to complete the finale…*cue drumroll, please* The Deathly Hallows! And, let me speak proudly (Henry V reminiscing), I am a spanking two-hundred sixty-nine pages into it already, so I should be done with that soon as well. For now, we are here to discuss Book 7! So, let’s begin then. I want to just talk about one thing during this post, actually. It’s not going to be nearly as long as my last spotlight post (which was a spanking 4440 words…don’t tell me it was overkill; I was just getting started), but it will be a substantial size. So, for this post I want to examine the idea of mortality and the soul as expressed in it. From what I’ve seen in Deathly Hallows, this theme will trail into that review as well, which I think is significant. I want to talk about the soul. The science and the theology of the soul. See, I couldn’t think of anywhere else to write about this. You, my audience, are quite unlike any other. The others, in fact, might misunderstand me. I was in the library the other night—in the restricted section—and I read something rather odd about a bit of rare magic. It’s called, as I understand it, a horcrux. No, I am not the next Riddle child to become a Dark Wizard, but I am interested, in this post, in discussing the concept of the soul and the ideas Rowling puts forward in her book about the subject through the manifestation of horcruxes and other means. This won’t just be a discussion on horcruxes, but rather an overall look at the theme of life, death, and the soul in this book. So, let’s begin then, shall we? Since this post is only covering one facet of this gem of a book, it may be a bit smaller than the other spotlight posts, which may, in turn, make it more likely to be read. Let’s start off with the etymology of the word “horcrux.” Rowling is commonly known for using Latin words to create spells, however the origins of her word “horcrux” are actually French: “dehors” meaning “outside” and “crux” meaning “soul.” There you have it: the outside soul (Vendetti). Read more on that HERE. What is a horcrux? A horcrux is an object that contains a fragment of someone’s soul in it. Using magic, the dark witch or wizard splits their soul and places it within an object to ensure eternal life. When the body is killed, as we see with Voldemort, the consciousness passes to the horcrux, but there is no body to contain the soul. However, as we also saw with Voldemort, he created his body once more in the chapter “Flesh, Blood, and Bone” in The Goblet of Fire. As quoted by McDonald earlier, the person is not a body. What defines us is not our physical form, for that is only temporal. The thing that makes us who we are is the soul. To create a horcrux and thus split one’s soul, you have to murder someone. Once you murder someone, you can split your soul and then you have to encase it into an object to protect it. Reading the chapter “Horcruxes” in this book was just about enough to make one’s skin crawl. The soul, in this book, is regarded as a highly sacred, beautiful thing that one possesses. To degrade it for purposes akin to Tom Riddle’s (eternal life) is absolutely horrendous, especially when killing is involved to sustain oneself. If you think about it, isn’t that how it is in real life, just in a less obvious way? When all one desires is to sustain oneself, to work hard, be superior above others by all means, it both rips one’s soul and kills the people around us. Horcruxes, the outside soul, represent, it seems, the division of one’s full life…the full beauty, grace, and love of personality, character, and trait. When these things are divided, we can no longer observe the powers of love, grace, and beauty, because we lack it ourselves. If you think about it, Voldemort didn’t “keep” his heart. Literally, not figuratively. He ripped it, stored it in a locket, cup, possibly his pet snake, and other places. The soul is the most valuable thing we possess…in fact, we don’t possess it. It is who we are. Protecting who we are is the most noble endeavor we could ever embark upon. The second thing I want to discuss before signing off is the death of Dumbledore. To be honest, Dumbledore’s death was actually spoiled to me when I was reading The Prisoner of Azkaban last year (I was listening to a Harry Potter playlist and listened to a song called “The Killing of Dumbledore…” rats). I was absolutely distraught when I first learned of it, but when I read about it, that was even more crushing. This past week, actually, someone I knew died, and it was one of the strangest, weirdest things that has ever happened to me. My great-grandmother passed away when I was barely eleven, but since then I have lived without the shadow of death over my life. But this week, I was literally jerked awake by the grim reality. I won’t go into details as to who it was, but he did mean a great deal to me. Calm down, my friends, I don’t have a boyfriend. He was more of a caregiver than anything, and he was sixty-five. It was weird, when I received the news, just feeling so icy on the inside. I was, for the first few hours, just numb. It didn’t seem real that he no longer walked upon the earth. Death is such a weird thing that we’ll never think it happens. Harry felt as though he too were hurtling through space; it had not happened….It could not have happened…. When the reality of death falls upon the Christian, as it did for me on Thursday, I was shaken. The feeling was awful. I could hear my mother’s own sobs downstairs. I didn’t want to see anyone, really, I just wanted to think and feel it. It wasn’t sinking in…. However, with Christ, there is a hope of seeing our loved ones again. There is a hope, for those who believe, of reunion, eternity, and love. I feel like while Rowling’s book did not endorse any kind of afterlife, there was a sense of moving on…death as a “stepping-off point” as the Black Panther would put it. 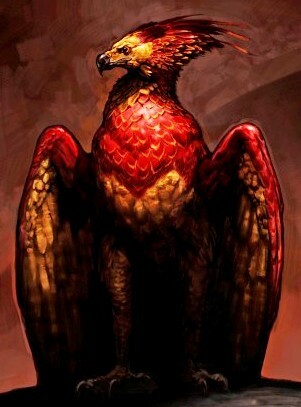 Well, think about the phoenix who flew away after Dumbledore’s funeral: Fawkes. The phoenix is a symbol of rebirth. After being burned, the phoenix emerges, renewed, looking more beautiful than ever. It does not die. I read that the phoenix represents immortality and victory over death. As Fawkes flies away at the end of The Half-Blood Prince, we are given the image of Dumbledore conquering the grave and flying toward heaven…just as Christ did. This book is officially my very favorite, but I haven’t finished The Deathly Hallows yet, so don’t judge me, alright? I’m so looking forward to writing my review on that one! Anyway, folks, there it is. Another spotlight post under my belt. I so thoroughly enjoyed this book, and I am actually looking forward to finishing the Harry Potter series, because I have so many books lined up for when I finish. Yes, I don’t deny it….I read way too many books. But that is always a good thing!